March 8, 2010: My gggrandfather was John Henry Kerns, son of Isaac and Rebecca Kerns. His son was Francis Albert Kerns who married Alma Alice Cooper, in C.B., Iowa in June 1889. John died in C.B. in Jan. 1889, and is buried near Thomas G. Kerns(spelled KEARNS) in section D of Fairview cemetery, Council Bluffs, Iowa. They are buried in the "Civil War" veterans section. Until this minute, I did NOT know Thomas was Johns' brother. My gggrandmothers maiden name as I found it was "Smith" she was the daughter of Aquilla and Elizabeth Smith, who lived and died and are buried in the same cemetery as Marilla in Winterset, Madison county, Iowa. Permilla was her older sister. She is buried next to Marilla. There was HUGE rift in @ 1900 amongest the Smith, Kerns, James family, That's prbably WHY no one on the other branches have heard of our line. Ggrandma, Alma, knew, and told stories, but never in depth about these people. Her daughter, my g-aunt, Blanche started writing down the names and dates told by Alma in 1955, 2years before Alma died. They've been pretty accurate,from my research. 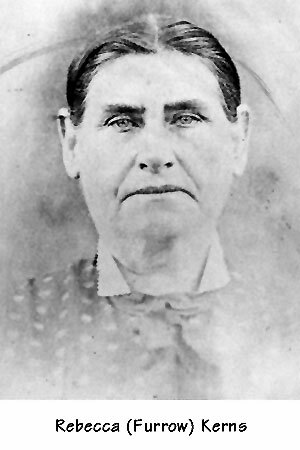 Marilla was born in Dec. @ the 5th of 1842 in Indiana. The Jamnes' also lived with Aquilla and Elizabeth Smith for a time in Indiana. 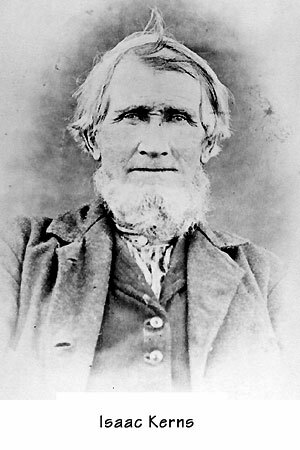 4) Charles( he lived with John and Permilla a short time after there marriage in 1882, then moved to C.B. to live with "Belle" and someone named "Henry P. Kearns"---notice spelling--, who died here in 1902 and is buried near "our" Thomas and gggrandpa John, but NOT in the Civil war area of section D, Fairview cemetery. Charlie died in 1902, and is buried in Walnut Hill cemetery, Here in C.B. ), and Bertha, who our tradition states that Marilla died giving birth to. Bertha was brought to C.B. by my ggrandfather, Francis @ 1883 to be raised by this "Henry" and the other "Marilla" kids. I won't go into detail, there are some stories of "SCARS" inflicted on the child that stayed with her, especially burns to her face. She married, here in C.B. in 1902. John finally joined the children in @ 1886, as stated, he died in Jan. 1889, from tetenus from a saw scrape. John and Permilla were married in the early fall of 1882, They had NO children, the marriage was not a very happy one, from LEGEND in our line. I'll go through my papers, which are about 28 inches deep, and compile a list of FACTS, but it'll take a while. I HAVE found facts that state Marilla was Permillas' younger sister. They were the daughters of Aquilla and Elizabeth SMITH, Aquilla was a "preacher" of some sort for the Baptist church, and in Madison county is known as a leader of the Baptist movement west-ward. The resting place of the Smiths' and Marilla and Permilla and Permillas' first husband, John Henry James, is the Baptist cemetery in Winterset, Madison county, Iowa, I have been there. Again THANK you for making my day, and IF you have pictures of John, or (especially) Marilla we'd be overjoyed to see them. I have a few pictures on disc, and if I can remember how to use the discs in this contraption, I'll send them to you. When you get one of my grandmother, Opal Mae (May) look at the eyes! I only found ONE picture of Isaac, BUT, look at the eyes! :):):), and to me, there is NO problem identifying my mom as Rebeccas' girl! Can you give me a clue as to who the "Thomas G. Kearns" buried near gggrandpa John is, and have you ANY record of a Samuel T. Kerns and his wife, Alice? There is a very lonely little grave of a little girl named Hannah Maud Kerns-died 1892--, daughter of SamueL T. and Alice Kerns, that I've kind of "adopted" as my own on memorial day, SHE was actually the reason I started the quest to find The Kerns' family legacy. She led me to the grave of a little lost uncles' grave. Hi Larry, I am going to try to give you some more information about my side of the Kerns Family. My Great-grandfather was Francis Albert Kerns. He had 5 children, Blanche, Charles, Clyde and William, and Frances Marie.. Clyde married a woman named Velma, and had no children. William never married, and as far as I know, had no children. Blanche married Henry Christoffersen and lived in Minnesota. I'm not sure about her children although I know she had some. Francis Marie married John Gray and lives in Illinois and has 3 children, I think. My grandfather was Charles Chester Kerns, born in Winterset, Iowa and buried in Council Bluffs, Iowa. He married Jennie Cecil Ritchie in Council Bluffs. Charlie had the following children: Orpha, William, Ivan, Francis Albert,(My father), Earl, and Jerry. I think there was a set of twins that died at birth or shortly thereafter. Orpha married Chester Blake and had one child, Chester Floyd Blake,Jr. All of them are deceased. Chester Jr married Bobbi, and had 2 children, Jerry and Wendy. William married Thelma Fauble and had 2 children, Dennis Patrick, deceased and Elaine. Everyone but Elaine is deceased. Elaine lives in Council Bluffs. Ivan married Mary last name not remembered, and had no children. Both Ivan and Mary are buried in Monroe, Iowa. Francis married Juanita Jean Heady and had 3 sons, Michael Dennis (me), David Jerome, and Patrick Donovan. I have 3 children, Kristine Lynn, Michael Charles, and Amanda Marie. I married Linda Powell in 1968, had Kris and Michael and divorced in 1975. I married Nina Marie Espersen in 1977 and had Amanda. Kris had 5 children and one grandchild, Jennifer, Joshua and Mellissa Rousu, and Megan and McKenzie Sinclair, all living in Council Bluffs.. Michael has 3 children from 3 different women, and currently lives in Orlando, Florida. Amanda married Nathan Petersen and, at this time has no children. David Kerns married Diane Dubinsky and had 2 children, Francis Albert, and Juanita Jean. Francis is currently serving in the Marine Corps, and Juanita lives at home in Council Bluffs. Patrick had one daughter,but was never married. Earl married Donna Mae Hathaway and had 2 children, Edward Earl, and Jenny.Earl and Donna divorced, Earl married Bridget, last name I don't remember, and had Bonnie, Mary and Lisa. While these are my cousins, I'm not sure of their last married names. Bridget died and Earl married a woman named Mary Jane, and both are now deceased. Jerry married Rosemary Wilson and had one daughter, Debra, and one child who died at birth. Debra married Don Stark and had 3 children but I can't remember their names. They live in Council Bluffs, although Rosemary is deceased. I know there are some spots that aren't covered, but I will contact my brothers and get more information. Sorry if this confuses everything, but as is every family, there are so many changes, divorces, deaths, etc. and it is hard to keep track. If I can provide anything else, please let me know. This came in from Nick on 11-18-10 and is viewable in the scroller below. My Grandmother, Opal Mae Kerns born in Feb. 1902 and died in 1984. And the little guy who started me on this search, George Leslie Kerns, born in 1898 in Madison county Iowa, and died Dec. 5. 1905, here in Council Bluffs, from tetnus he got when he cut his finger on a sled runner. Before grandma died, she aked me to find Georges' grave after all her kids had died, WELL mom died in 2000, she was the only living older sibling, and I was 50, so I went to Aunt Kathleen(Kat) and asked her if it would be ok with her if I started the search. She agreed, it took me 4 years, but I found his grave, because I found he had been buried in ths same plot in the cemetery as a 12 year old girl named Hannah Maud Kerns, daughter of Samuel T. Kerns, and Alice Kerns. She'd died in 1892, BUT she had a head stone. I got curious to find out WHO this Samuel was, asked Aunt Kat to send me Aunt Blanches writngs and away I went. Opal Kerns married Eveard Leslie Eakes in 1918. They had 3 children, Leslie Donovan Eakes(Later changed his name to Lester Nelson Eakes), Robert Edmund Eakes, And my mom, Alice Collene Eakes. Mom was born Nov. 5, 1924. She Married Nicholai (Nick--no middle name listed, but in his families language it's "Ivanovich"--meaning simply "son of Ivan", John in English) in May 1942. Eveard and Opal divorced in 1925. In 1928 Opal married Robert Fisk. They had 2 daughters, Blanche Velma Fiske, who died from whooping cough at age 1 month in 1929, and Billie Joy Fisk, and sorry, like with the uncles, their dates are NOT in my head, I'll send later. Opal and Robert were divorced in 1940. Opal married a man named Smythe in 1944. They had one daughter, Charlotte Kathleen, born Oct. 5, 1944. This Smythe man was killed in late 1944. I can get details later.